Multidrug resistance (MDR) is a phenomenon that is often associated with decreased intracellular drug accumulation in patient's tumor cells resulting from enhanced drug efflux. It is related to the overexpression of a membrane protein, P-glycoprotein (Pgp-170), thereby reducing drug cytotoxicity. A variety of studies have tried to find MDR modulators which increase drug accumulation in cancer cells. In this study, natural curcuminoids, pure curcumin, demethoxycurcumin and bisdemethoxycurcumin, isolated from turmeric (Curcuma longa Linn), were compared for their potential ability to modulate the human MDR-1 gene expression in multidrug resistant human cervical carcinoma cell line, KB-V1 by Western blot analysis and RT-PCR. Western blot analysis and RT-PCR showed that all the three curcuminoids inhibited MDR-1 gene expression, and bisdemethoxycurcumin produced maximum effect. In additional studies we found that commercial grade curcuminoid (approximately 77% curcumin, 17% demethoxycurcumin and 3% bisdemthoxycurcumin) decreased MDR-1 gene expression in a dose dependent manner and had about the same potent inhibitory effect on MDR-1 gene expression as our natural curcuminoid mixtures. These results indicate that bisdemethoxycurcumin is the most active of the curcuminoids present in turmeric for modulation of MDR-1 gene. Treatment of drug resistant KB-V1 cells with curcumin increased their sensitivity to vinblastine, which was consistent with a decreased MDR-1 gene product, a P-glycoprotein, on the cell plasma membrane. Although many drugs that prevent the P-glycoprotein function have been reported, this report describes the inhibition of MDR-1 expression by a phytochemical. The modulation of MDR-1 expression may be an attractive target for new chemosensitizing agents. The human MDR-1 gene encoding for MDR transporter (Pgp-170) belongs to ATP-binding cassette (ABC) transporter superfamily. The MDR-1 overexpression has been reported in many tumors and in vitro selected drug-resistant cell lines [1–4]. Uptake and/or efflux of isotope-labelled drugs or rhodamine123 are frequently used for functional assay of Pgp-170 in tumor cells. Several classes of MDR modulators that inhibit Pgp-mediated efflux have been identified. It has been found that the accumulation of chemotherapy agents in tumor cells with overexpressed Pgp-170 was significantly reduced as compared to the MDR antagonist-treated tumor cells [5–7]. The other approach for MDR regulation is the modulation of the MDR-1 gene. Studies of the MDR-1 gene promoter sequence suggest that inhibition of Pgp expression at the genetic level may be possible . These types of MDR modulators may either block the induction of MDR-1 gene expression or inhibit its promoter and down-regulate Pgp expression. The rhizome of the plant Curcuma longa Linn is commonly called turmeric and has been widely used as a spice, to color cheese and butter, as a cosmetic, and in some medicinal preparations [9, 10]. The dry rhizome of turmeric contains curcumin, the main bioactive component, demethoxycurcumin and bisdemethoxycurcumin. The chemical structures of these curcuminoids are shown in Figure 1. The traditional uses of turmeric or natural curcuminoids in folk medicine are multiple, and some of these therapeutic effects have been confirmed by scientific research, including antioxidant , anti-inflammatory properties , anti-carcinogenic effects [12–14] and hypoglycemic effects in humans . The safety of the Curcuma longa has been studied in various animal models [16, 17], and it is clear that turmeric is not toxic even at high doses in laboratory animals. In our previous studies, we have found that commercial grade curcumin down-regulated Pgp-170 expression in human cervical carcinoma KB-V1 cells . In this study we examined the most active form of curcuminoids present in turmeric, as a potent inhibitor of MDR-1 gene expression. This led us to also evaluate the structural requirements for the pharmacological activities of curcuminoids. We demonstrate that bisdemethoxycurcumin is the most active of the curcuminoids present in turmeric for modulation of MDR-1 gene. In addition, treatment of drug resistant KB-V1 cells with curcumin increased their sensitivity to vinblastine, which was consistent with a decreased MDR-1 gene product, a P-glycoprotein. Silica gel 60 and petroleum ether was purchased from Merck. 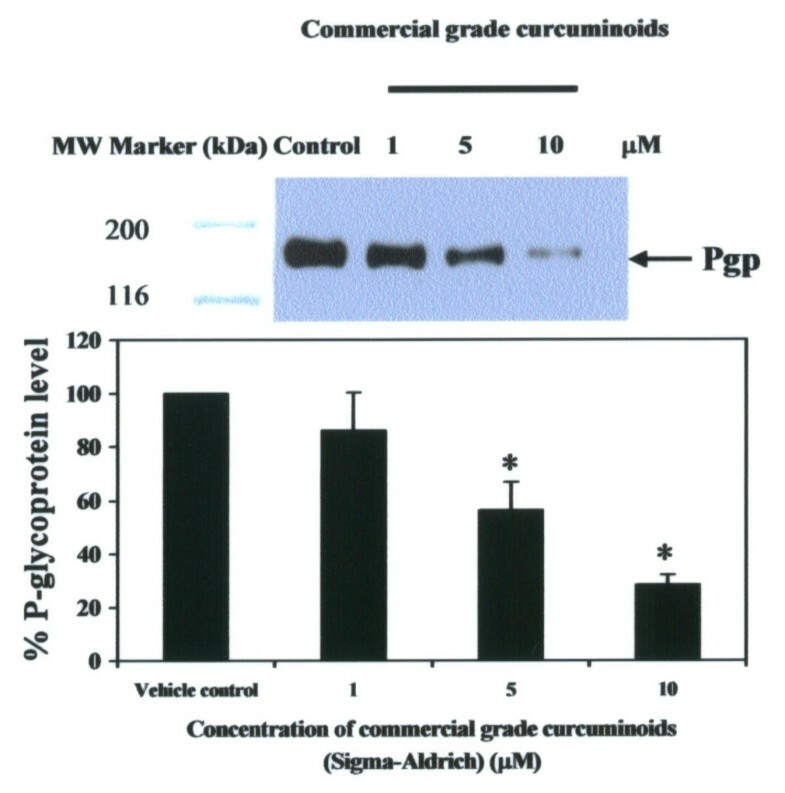 Commercial grade curcuminoids (77% curcumin, 17% demethoxycurcumin and 3% bisdemethoxycurcumin) and mouse monoclonal anti-P-glycoprotein (MDR) clone F4 were purchased from Sigma-Aldrich. DMEM (Dulbecco's Modified Eagle's Medium), One-step RT-PCR reagent, TRIZOL reagent, HBSS and primers were purchased from GIBCO-BRL. HRP-conjugated goat anti-mouse IgG was purchased from Amersham. A SuperSignal® detection kit was purchased from Pierce. An MTT viability kit was purchased from Promega. Chiang Mai turmeric powder (1 Kg) was successively extracted with hexane (2.5 L) and 95% ethanol (7.5 L) at room temperature. Turmeric curcuminoids were then precipitated with petrolium ether yielding 50 g crude curcuminoid mixtures (78% curcumin, 16% demethoxycurcumin and 5% bisdemthoxycurcumin). The curcuminoids (3 g) were further fractionationed by Silica gel 60 column chromatography (44 × 1.6 cm) using first CHCl3 and then CHCl3/MeOH with increasing polarity. Fractions containing curcumin (1.11 g) were eluted with 100% CHCl3 (0.6 L). Fractions containing demethoxycurcumin (200 mg) and bisdemethoxycurcumin (40 mg) were further eluted with CHCl3/MeOH (98:2, 0.8 L) and CHCl3/MeOH (95:5, 1 L), respectively. The multidrug resistant cell line, KB-V1 (multidrug resistance cervical carcinoma cell line) and KB-3-1 (drug sensitive cervical carcinoma cell line) were generous gifts from Dr. Michael M. Gottesman (National Cancer Institute, Bethesda, USA). The KB-V1 cells were plated and then grown to 80% confluence in T-25 cm2 culture flasks in the presence or absence (vehicle control, 0.1% DMSO) of crude curcuminoid mixtures, pure curcumin, demethoxycurcumin and bisdemethoxycurcumin at the concentrations indicated in the text for 3 days. Cells were then washed with ice-cold phosphate-buffered saline (PBS pH 7.4), harvested by scraping, and homogenized in 10 mM KCl, 1.5 mM MgCl2, 2 mM PMSF and 10 mM Tris-HCl, pH 7.4 for 30 strokes. The cell homogenates were centrifuged at 4,000 g for 10 min at 4°C. The supernatant was collected and centrifuged at 100,000 g for 1 hr at 4°C. This pellet (plasma membrane) was resuspended in Laemmli buffer , divided into 20 μL aliquots and stored at -20°C. The membrane protein concentration was measured by the Folin-Lowry method . The cell membrane proteins (10 μg/lane) were separated by a 7.5% SDS-polyacrylamide gel electrophoresis and electroblotted overnight onto nitrocellulose filters. The filters were incubated sequentially with primary mouse monoclonal anti-Pgp clone F4 at 1:5,000 and HRP-conjugated goat anti-mouse IgG at a 1: 20,000 dilution. Proteins were visualized by the SuperSignal® protein detection kit (enhanced chemiluminescence, ECL), and quantitated by scanning densitometry. RNA of KB-V1 was isolated by TriZOL reagent®. The amount of RNA was determined by 1 OD (absorbance at 260) = 40 μg/mL. RT-PCR was performed using One-step RT-PCR®. For MDR-1 gene, the forward primer sequence used was GCCTGGCAGCTGGAAGACAAATACACAAAATT and the reverse primer sequence used was CAGACAGCAGCTGACAGTCCAAGAACAGGACT, corresponding to residues 406–437 and residues 657–688, respectively, of the published cDNA sequence . Using these primers, PCR yields gave a 283-bp product. Evaluation of β-actin expression, used as control of the RNA amount, was carried out by using the forward primer sequence CAGAGCAAGAGAGGCATCCT and the reverse primer sequence TTGAAGGTCTCAAACATGAT corresponding to residues 216–235 and residues 405–424, respectively, which yield a 201-bp product. Amplification was performed for 30 cycles of sequential denaturation (94°C, 1 min); annealing (55°C, 1 min); and extension (72°C, 1 min). For negative control, water was amplified a total of 30 cycles to detect possible contamination. A total 10 μL of each PCR product was electrophoresed in 1X Tris/acetate/EDTA (TAE) electrophoresis buffer on a 1% agarose gel. Gels were stained with 2 μg/mL ethidium bromide and photographed with Polaroid positive-negative film. The negative films were analyzed by scanning densitometry. Cells were incubated in 96-well plates (1.0 × 104/well), in 100 μL medium, before drug treatment at 37°C for 24 hr. After 24 hr, the cells were variably treated in their respective medium (100 μL), and incubated for another 24 hr. The metabolic activity of each well was determined by the MTT assay  and compared with that of untreated cells. Data are the means ± SEM from triplicate samples of three independent experiments. Differences between the means were analyzed by one-way analysis of variance. Results were considered to be statistically significant when P < 0.05. Due to drug resistance properties, KB-V1 cells have been shown to express only Pgp at a high level  on their plasma membrane, but Pgp was not expressed in the drug-sensitive cells (KB-3-1). As KB-3-1 and KB-V1 cell lines have been characterized extensively with respect to the phenomenon of MDR as well as the function of Pgp, we decided to use these cell lines to assess the effect of curcuminoids on the expression of Pgp. 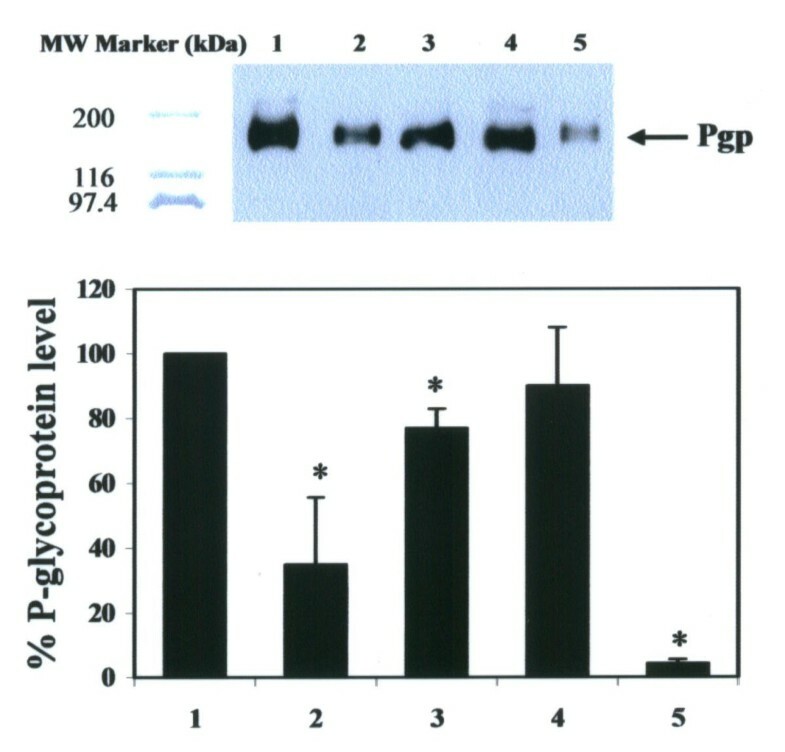 Pgp expression of KB-V1 cells decreased after treating the cells with 1, 5, and 10 μM commercial grade curcuminoid mixtures (Sigma-Aldrich) for 3 days, as determined by Western blotting with monoclonal antibody, F4 (Sigma-Aldrich). The Pgp levels in KB-V1 cells were decreased by 14, 44, and 72% in response to treatment with 1, 5, and 10 μM commercial grade curcuminoid mixtures, respectively, compared with the vehicle control at day 3 of growth (Figure 2). From our previous report , curcuminoids at 1, 5 and 10 μM did not affect the growth of KB-V1 cells compared with the vehicle control. Pgp was undetectable in KB-3-1 cells in vehicle control or curcuminoids-treated cells (data not shown). The results demonstrate the possibility of using curcuminoids in cancer chemotherapy as an MDR modulator. 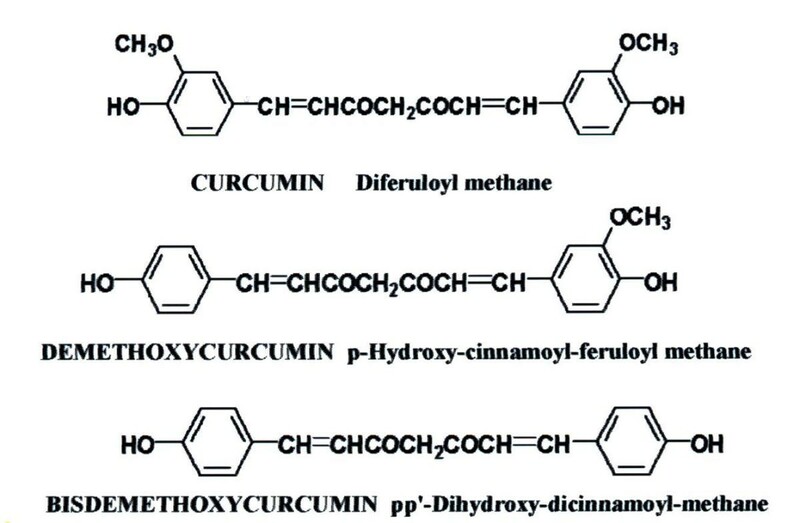 These observations suggest a need for further research on the MDR modulating activities of curcumin and its derivatives. Pgp expression in KB-V1 cells cultured in 1, 5, and 10 μM commercial grade curcuminoid mixtures for 3 days The Pgp protein level was determined by Western blotting using Mab F4 (top), and quantified by laser densitometry (bottom). Data are the mean value ± SEM of three independent experiments. Key: (*) significantly different from the vehicle control (P < 0.05). In this study we examined the most active form of curcuminoids present in turmeric for modulation of MDR-1 gene. Our preparation of crude curcuminoid mixtures from Chiang Mai turmeric are composed of 78% curcumin, 16% demethoxycurcumin and 5% bisdemthoxycurcumin, which are curcuminoid proportions close to commercial grade curcuminoids obtained from Sigma-Aldrich. Since treatment of the cells with 5 μM crude curcuminoids (Figure 2) resulted in potent inhibitory effects on Pgp level, we used this concentration for further analyses. The effects, at 5 μM, of our preparative crude curcuminoid mixtures, pure curcumin, demethoxycurcumin and bisdemethoxycurcumin on Pgp expression are shown in Figure 3. The best inhibitor is bisdemethoxycurcumin, followed by curcumin and then demethoxycurcumin, with Pgp levels of 12%, 57%, and 90%, respectively, compared with the vehicle control. Our preparative curcuminoid mixtures had about the same potent inhibitory effect on MDR-1 gene expression as commercial grade curcuminoid mixtures. To verify if curcuminoids could modulate the spontaneous Pgp expression (mRNA) occurring in vitro, 5 μM of our preparative crude curcuminoid mixtures, pure curcumin, demethoxycurcumin and bisdemethoxycurcumin were added to the culture medium and the cultures were examined at 72 hr by RT-PCR. 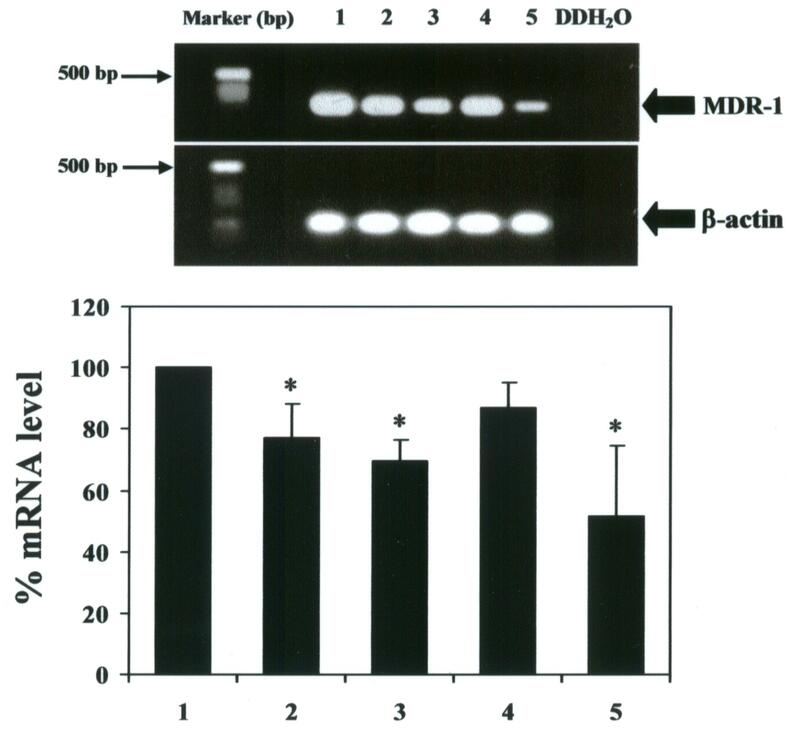 Expression of MDR-1 mRNA was determined by measuring the PCR product after amplification. Values for the expression of MDR-1 mRNA (after normalization to β-actin expression) by KB-V1 cells after treatment with 5 μM crude curcuminoids, pure curcumin, or bisdemethoxycurcumin, were significantly decreased by 13%, 30% and 49%, respectively, when compared with the vehicle control (Figure 4). In comparison, no significant decrease was found in level of mRNA MDR-1 expressed by KB-V1 cells that had been treated with 5 μM demethoxycurcumin. Pgp expression in KB-V1 cells cultured in DMSO (vehicle control; lane 1), laboratory made-crude curcuminoids (lane 2), pure curcumin (lane 3), demethoxycurcumin (lane 4) and bisdemethoxycurcumin (lane 5) at 5 μM for 3 days The Pgp protein level was determined by Western blotting using Mab F4 (top), and quantified by laser densitometry (bottom). Data are means ± SEM of three independent experiments. Key: (*) significantly different from the vehicle control (P < 0.05). Effects of laboratory made-crude curcuminoids, pure curcumin, demethoxycurcumin and bisdemethoxycurcumin on mRNA MDR-1 expression in KB-V1 cells The MDR-1 and β-actin mRNA levels, following treatment with the DMSO (vehicle control) (lane 1), crude curcuminoids (lane 2), curcumin (lane 3), demethoxycurcumin (lane 4) and bisdemethoxycurcumin (lane 5) at 5 μM for 3 days, were determined in KB-V1 cells by RT-PCR. Double distilled water (DDH20) was used as a negative control. Data are the mean value ± SEM of three independent experiments. Key: (*) significantly different from the vehicle control (P < 0.05). Western blotting and RT-PCR assays show that curcumin, the major component of turmeric, is a potent inhibitor of Pgp expression. Therefore, the measurement of vinblastine cytotoxicity was performed by a MTT colorimetric assay in the presence and absence of curcumin. 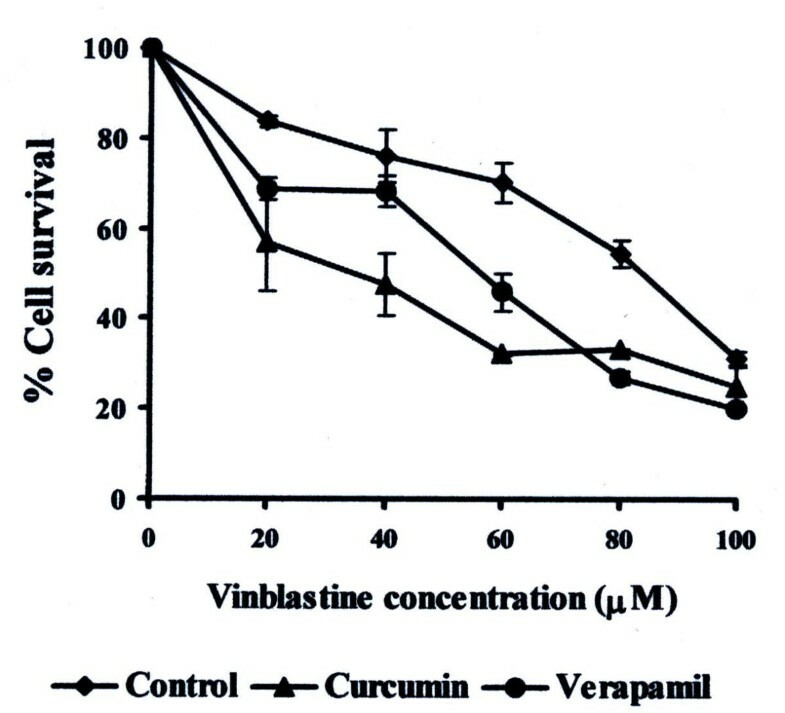 In drug-resistant KB-V1 cells, co-incubation of vinblastine with either 20 μM verapamil (positive control) or 20 μM curcumin (non-toxic dose) resulted in a significant increase in the cytotoxicity of vinblastine (Figure 5). Incubation of wild-type KB-3-1 cells with increasing amounts of vinblastine resulted in a decrease in cell growth that was not affected by incubation with curcumin (data not shown). Effect of pure curcumin on the cytotoxicity of vinblastine The KB-V1 cells were grown in medium with 1% DMSO (vehicle control), 20 μM curcumin or 20 μM verapamil (positive control) in the presence of different concentrations of vinblastine. The number of viable cells was determined by the MTT assay. Data represent means ± SEM, N = 3. It is not known which part of the curcumin molecule promotes the inhibitory effect on MDR-1 expression. Phenolic hydroxyl groups, phenolic methoxy groups and/or the diketone moiety could be responsible for the inhibitory effect on MDR-1 expression. Our results indicate that hydroxy groups on the benzene rings and the diketone moiety are not essential for the activity; the three curcuminoids have the same number of hydroxyl groups and the diketone moiety (Figure 1) but a different inhibitory activity on MDR-1 expression. The fact that bisdemethoxycurcumin is the most active of the curcuminoids present in turmeric for modulation of MDR-1 gene suggests that the methoxyl groups might regulate for the activity; bisdemethoxycurcumin, the best inhibitor, possesses no methoxyl group, while curcumin and demethoxycurcumin possesses two and one methoxyl groups, respectively, and are less inhibitory. Although the mechanism by which curcuminoids produced Pgp down-regulation is not deducible from the present data, the effects of curcuminoids on MDR-1 gene promoter activity in human cervical carcinoma cells, KB-V1, are now under investigation in our laboratory. The present study suggests that curcuminoids could be considered as promising lead compounds for the design of more efficacious MDR modulators, and bisdemethoxycurcumin is the most active of the curcuminoids present in turmeric for the modulation of MDR-1 gene expression. Treatment of drug-resistant KB-V1 cells with curcumin, the main component in turmeric, increased their sensitivity to vinblastine, which was consistent with a decreased Pgp level. This work was supported by a grant from Thailand National Center for Genetic Engineering and Biotechnology (BIOTEC), National Science and Technology Development Agency (NSTDA). We thank Dr. Michael M. Gottesman (National Center Institute, NIH) for the gift of KB-3-1 and KB-V1 cell lines. Pornngarm Limtrakul contributed 60% to this work. Songyut Anuchapreeda contributed 30% to this work. Duang Buddhasukh contributed 10% to this work.